Jason Anderson's day started out a bit slow in practice 1. He qualified a decent 7th, but his times were way off of where he wanted to be. After meetings in the team semi's war room discussing lines in every section of the track with Team Owner Bobby Hewitt, Jason set out to improve in the second qualifying session. The improvement was massive. Anderson knocked an astounding 11 seconds off his original fastest lap and he looked very good on the bike. In the opening 250 moto he was buried in the pack exiting turn one, sitting in about 25th position. He began passing riders by the handful and immediately found himself in the top ten less than halfway through the first lap. One negative aspect to so many ruts is that sometimes lines cross. Once you're committed and you're in, you just go. Jason's line ended up leading to just that, and a collision with another rider sending him to the ground. He remounted and shortly after the first incident, he was just simply cleaned out. Picking himself up one more time, he was right back where he started, outside of the top 20. His riding after that was nothing short of impressive. Although he appeared to be pushing very hard and riding through frustration, he held it together climbing all the way back to 11th, where he finished. JA's 2nd moto started much better, but finished way worse. He looked to be poised to finish easily in the top 5 when he landed on a breaking bump on the huge step-up, swapping and going down hard. The team looked on in disbelief as Anderson crawled to the side of the track and then with elation as he stood up. He was banged up a bit but luckily just had the wind knocked out of him. Sometimes being one of the fastest guys on the track just isn't enough. 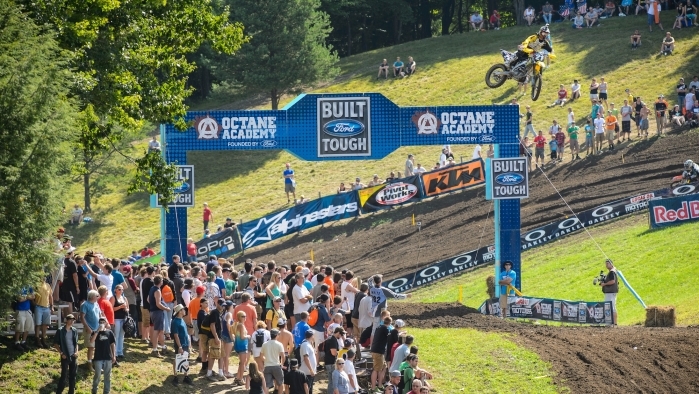 Jason Anderson: "Unadilla was not a great day but I rode good. I ended up going 11-DNF which is not stellar. I like Unadilla and I usually do good here except today. Hopefully we can do better next weekend, which shouldn't be too hard." Anderson will head to Miller Motorsports Park in Toole, Utah healthy and hungry for a second podium. The team will hope to see Ryan Sipes return next weekend after having surgery on a broken knuckle last week. Sipes and Anderson will also be joined by fill in rider Michael Lieb.